I have avoided rubber stamping because, knowing me, I'd have to own all of them (with a drawer full of stamp pads) in order to feel control over the craft. But I love creating collages and fantasy mail in Photoshop. Having reusable design elements makes this more fun. The Paintbrush Tool is what you use to create your own stamps. In this tutorial, we'll convert a well-aged storage tag into a stamp. Like physical stamps, virtual stamps are monochrome tools, so pick a subject that looks good in grayscale. Scan your subject. Because you will need to extract it from its background, scanning against a contrasting color (like my purple paper) will make your job much easier. Try to make your completed scan result in an image as large as the biggest likely stamp you'll need. Save the file or Open it in Photoshop. Crop your image as tightly as possible (Image>Crop). Not strictly necessary, but keeps things neat and the file small. Rename your copied layer Tag. Between the Original and Tag, add a new layer. From the Swatches Palette, pick a really garish foreground color (different from your scan). I chose a red. Fill (ALT-BKSP) the new layer. This will help you see if you've adequately separated your subject from the background. Name the layer to keep you compulsively organized. There are many ways to separate a subject from its background, all involving degrees of skill in selection. The Magic Wand Tool or the Filter>Extract command can be helpful here. Because I scanned the tag against a purple piece of paper, I can use the Select>Color Range command. First, with the Eye Dropper Tool (CTL-I), touch the background to make it your foreground color. Then, Select>Color Range opens a dialogue. Test your selection in different Preview modes. If you've selected a good color you can accept the defaults. Otherwise, tweak the Fuzziness parameter till the selection preview looks how you want it to. Press OK.
On the screen you'll see the background color selected. Press Delete. The purple should disappear and the Red layer should show through. Cautious Alternative: Use Select>Inverse to change the selection from the purple background to the tag itself. Layer>Layer-Via-Copy (CTL-J) to create a new layer with the isolated tag only. Turn off the Tag layer eyeball to see your results. If you're satisfied, then you can delete the Tag layer and rename this layer Tag. Option: If you prefer to work with the monochrome tonal range of the final "stamp," with the Tag layer selected, use Image>Adjustments>Hue/Saturation and move the Saturation slider to 0. 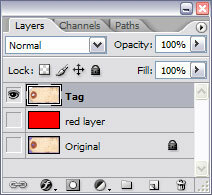 With Tag layer selected, use Image>Adjustments>Levels to sharpen the contrast or change the light/dark balance. Keeping a full tonal range preserves the feeling of a physical rubber stamp. Cautious alternative: Use an adjustment layer on top of your Tag layer. When you're satisfied, you can leave it as it is or Merge it down into Tag (CTL-E). Make your digital stamp with Edit>Define-Paintbrush-Preset. In the dialogue box, name your brush. Select the Paintbrush Tool. Your new brush will appear at the bottom of your current set of paintbrushes. Select it and use the size slider to adjust the size as desired. From the Swatch Palette, pick a foreground color. 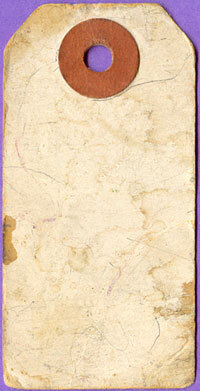 Change the angle of the stamp by using the little compass under Brush Palette>Brush Tip Shape. 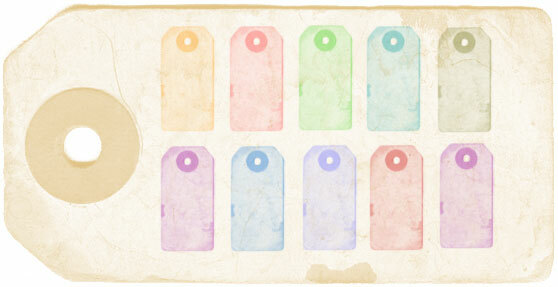 You can use Edit>Preset-Manager to create and edit sets of your digital stamps. Oh, to hell with all these steps! 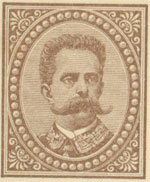 I see an oblong stamp on an 1887 postcard. Select it with the Marquee Tool.